This "Historically Speaking" column appeared in the Exeter News-Letter on Friday, February 1, 2013. Considering Exeter was founded in 1638, it can be frustrating that we don’t have any accurate maps of the town for the first 164 years of its history. Be that as it may, we are lucky to have a map produced in 1802 that provides us with a snapshot of the town as it looked in the years just after the Revolution. The purpose of the act was to create a State map of New Hampshire. The town maps had to be complete by November 1, 1805. Failure to comply would incur a $150.00 fine. Luckily for Exeter, we already had an accurate map of the town created by one of the state’s finest surveyors – Phineas Merrill of Stratham. Merrill, who was born in 1767, was a self-taught surveyor. He served in many capacities in Stratham, including town selectman, school teacher and state legislator. In an attempt to simplify his arithmetic classes, he published the Scholar’s Guide to Arithmetic in 1793, which was republished numerous times over the years. The copy in the collections of the Exeter Historical Society was the fourth edition published in 1802. In it, he expresses his need for list of arithmetical rules while teaching, but “my school being often crowded, I had not time either to write or see to the writing, of such Rules and Questions as were necessary without neglecting the other exercises of the school.” Most teachers will understand this frustration of too much to do and too little time to do it. His best-known skill, however, was as a map maker. When the 1803 Act was passed, Merrill became the obvious choice to assist Phillip Carrigain, the Secretary of State, with the immense task. Together they collected the maps that were submitted to the state and returned 130 of them to the towns because they weren’t deemed accurate enough. Historian Charles Bell, of Exeter, later wrote that “the surveys of some of the towns were made by incompetent persons, and it required ingenuity if not actual force to fit them perfectly together.” Of the hundreds of maps submitted, those made by Phineas Merrill were some of the most beautifully done. Merrill surveyed the towns of Barrington, Bartlett, Greenland, New Castle, Portsmouth, Rye, Stratham and, of course, Exeter. For his Stratham and Exeter maps, Merrill merely had to update those that he had already made. He’d laid out a map of Stratham in 1793 – the same year he wrote his Scholar’s Guide to Arithmetic. It is remarkable in its detail. Not only do Merrill maps lay out the boundaries of the town and any geographical features, but as a cadastral map he includes the names of the landholders and a rough idea of what the houses looked like. Clusters of homesteads appear along the roadways and one can almost visualize the reasons people chose to live in a certain spot. 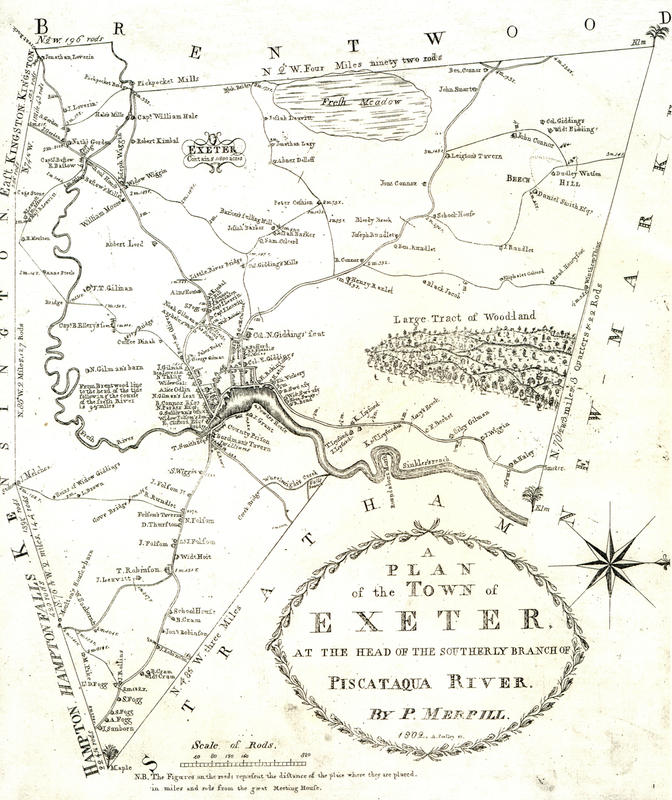 Merrill made the map of Exeter in 1802 – before the mapping act was passed. There were actually two versions created that year – the first is a view of the entire town, including the streams, meadows, woodlands and the Exeter and Squamscott rivers snaking through town and heading out to sea after absurdly winding around the oxbow. 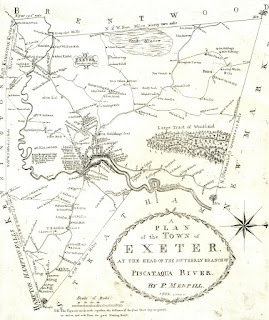 Once he’d finished his map of the entire town, he made another one of the “compact part of the Town of Exeter,” which laid out the central business district known to most as simply ‘the village.’ Here we find not just the homesteads and farms in town but the local merchants and churches. Phillips Exeter Academy is a prominent feature as are all the mills located along the river. The map was printed before the mighty Exeter Manufacturing Company engulfed the smaller mills and set up its cotton factory on the east side of the river. Copies of the 1802 Merrill maps of Exeter, printed from the original copper plates, are still available at the Exeter Historical Society.